The social, environmental and economic value of trees can be thought of as a closely intertwined network of roots in a vast forest. Human sustainability cannot exist without environmental sustainability, and the value of trees extends considerably beyond their direct economic benefits. Most New Zealand buildings are constructed from timber, our food and beverages would be nutritionally more impoverished without tree-based foods, and the overall health of the planet and the wellbeing of people rely on trees, plants, and healthy water ecosystems. 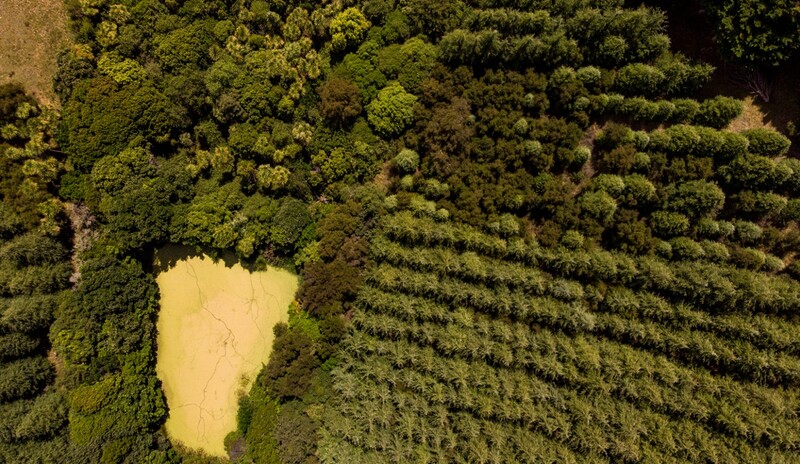 New Zealand has grown by extracting native timber allowing for farming and plantation forests. During that process, the forestry and orcharding production rotation mindset have sometimes led to poor decision-making for non-commercial trees. The economic value of trees is straightforward. Hawke’s Bay accounts for about 65% of NZ apple exports exceeding $700 million annually; meanwhile forestry makes up about $5 billion (3% of GDP). Commercial forests occupy 1.8 million hectares (7% of total NZ land area), with 90% planted in a monoculture of Pinus radiata. Napier Port exported 2 million tonnes of logs in 2018, which is projected to increase by 50% within eight years. 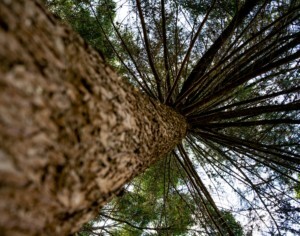 Trees are big business for Hawke’s Bay. Tree industries employ large workforces, with forestry alone directly employing around 20,000 people. Add to this considerable investment in land and buildings, plant and equipment, all supported by and benefitting many sub-industries. There are less direct ‘socio-economic’ benefits as well. Urban greening is proven to increase workplace productivity, social wellbeing, and health. Lead researcher Daniel Cox (University of Exeter), who references studies by Dr Margaret Stanley (University of Auckland), published on the matter in Landscape and Urban Planning 185 (2009). The research finds that people working indoors focus their attention on specific tasks and “the presence of a window with a natural scene allows micro-restorative experiences”. The more interesting these experiences are, the “more restorative”. Researchers say that there is “robust evidence” that indirect experiences with nature have health and wellbeing benefits, including “increased psychological wellbeing, improved cognitive function and concentration, reduced healing times”, and better workplace outcomes. Their studies and others add weight to why heritage and notable trees should be protected and highlight why trees in general need to play a significant role in towns and cities. High stature trees on private land have community collective value, not dissimilar to significant landscapes like Te Mata Peak. Treasured landscapes, including privately-owned land, are subject to rules that allow for public benefit. Trees of significance (individual trees or groups) are partially owned by everybody. Private landowners accept stewardship responsibilities, like being unable to legally pollute air or water, carve up a treasured mountainside, or destroy a protected building. Unfortunately, necessary rules impinge upon private rights. Landholders contract with the community to foot the related costs, including maintaining protected trees. Land use rights are always partially subordinate to community rights – a limited bundle of rights that governments, councils and the courts may occasionally modify, with landholding constraints and liabilities ultimately adjusted for in property values. In 2016, Christchurch City proposed to delist 789 private land heritage trees and 742 public land trees. However removing the protection from these significant trees was firmly opposed by the public, led by Christchurch Civic Trust, the NZ Notable Trees Trust, and Royal NZ Institute of Horticulture. The submissions made by volunteer campaigners successfully persuaded the Council to reverse its decision, and the listed status of the trees was reinstated under the District Plan. Turley & Co gave land economy evidence in support of protecting these trees. Our evidence indicated that private landowners could make a considerable profit from the removal of these trees, should the trees lose their protection status, because of the land’s increased potential for higher density housing. The evidence established that environmental values and the collective value of the trees to the community far outweighed that of the individual property owners. The relatively young heritage trees of NZ and Hawke’s Bay include beautiful trees 100-160 years in age. The wildlife habitats, carbon sequestration and broader ecological benefits of older trees are significant. The value of existing trees to birdlife, the environment, and people usually far outweighs the minute risks of properly-managed older trees. Every well-grown tree within a public place poses its problems, but the key is to manage these problems and approach them sensibly. While oaks tend to grow quickly in New Zealand, their life potential is unknown because exotic trees in New Zealand are in their infancy. Parks and woodlands in England hold oaks at least 300 years old – 1,000 years being their life potential. It is less for North American oaks, and this longevity is still being tested in New Zealand. The Frimley Park black poplar in Hastings, at 144 years old, is the largest specimen in the world. It is also New Zealand’s largest deciduous tree at 42 metres tall and 10 metres girth. Last year it was initially proposed to be felled due to risk. Council was dissuaded by tree experts, and the poplar was instead trimmed. There were similar risk concerns in 2011 for the 159-year-old, 36-metre-high Tasmanian blue gum, next to St Columba Church in Havelock North. The tree was preserved by independent expert arborists’ knowledge and the tree retained with risks managed at acceptable levels. The Havelock North Keirunga oaks planted by George Nelson on gifted land have triggered the latest local debate. Council proposes felling about 46 oaks, many of which are over 80 years of age, plus another 43 deciduous trees within the Keirunga woodland. HDC’s proposal is made in the name of risk management, prior undermanagement, a view the trees are end-of-life, and “a number of requests to remove trees that shade and impact on the [seven recent] adjoining properties along the Kopanga Road boundary”. However, others believe that cutting down these trees could be an irreversible mistake. Experts are assessing the wood and public submissions now close mid-March … robust debate is underway! 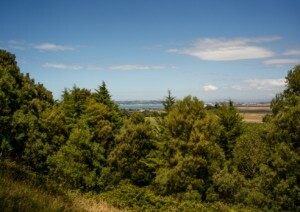 The NZ Notable Tree Trust maintains the online New Zealand Tree Register that holds a growing list of the country’s notable trees, 165 of which are in Hawke’s Bay. Hastings District Council is a longstanding annual supporter. Turley & Co and others are register sponsors. The public can submit new trees on public and private land for addition to the register. At the same time, Hawke’s Bay has one of the most denuded landscapes in New Zealand. This is mainly attributed to the use of fire to clear cutover bush to bring land into pasture. In 2018 Hawke’s Bay Regional Council and Ngāti Kahungunu Iwi signed the Kahutia Accord, which set a framework for co-investing in re-cloaking Hawke’s Bay’s vulnerable landscapes. If HBRC’s proposed investment is ratified following public consultation, Kahungunu and the Council will set out to plant 100,000 hectares of Hawke’s Bay land by 2030 – 1,000 square kilometres, or 247,000 acres, in re-established multispecies and native forests … ‘the right tree in the right place’ the Council promises. The ecological drivers are to curb erosion and silting of waterways and coastal environments, counter the adverse effects of forestry harvesting, protect landscapes against extreme weather events, increase carbon sequestration, and significantly bolster biodiversity. The economic and social drivers include revenue; new industry, skills, employment; and reconnecting people with natural places. The regional council has already confirmed a $30m budget over the next decade for riparian planting, to protect the water quality of streams and retain soil on private farmland by co-funding partnering. Maraetōtara Tree Trust’s partnership with HBRC and landowners has been achieving this on the Maraetōtara River for 17 years. Over one-half of 86 kilometres both sides have been reserved and planted in native species. Hawke’s Bay’s overall tree cover is set to be significantly improved, its native birdlife and other fauna further repopulated, and its waterways and coastal ecosystems made much healthier. 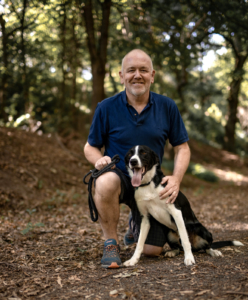 Pat Turley at Keirunga Wood in Havelock North with his dog Flynn. 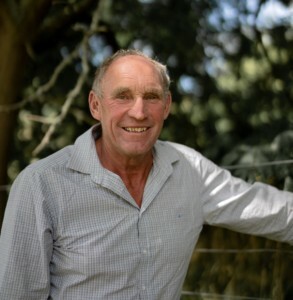 It is easy to make a case for planting more trees in Hawke’s Bay, and it is equally important that we keenly protect longstanding existing trees that offer possibly centuries of value to generations of people, and the environment. Notable and heritage trees are many decades in the making and not easily replicated, unlike reinstating a destroyed building. When felled, these trees often leave a hole environmentally and socially, that is not easily backfilled. Certain trees in New Zealand have reached incredible ages, such as Tāne Mahuta, the largest living kauri. Tāne Mahuta has a girth of 14 metres and is estimated to be an astonishing 1,250 to 2,500 years old. Unfortunately, the Lord of the Forest could one day be threatened by the current challenge of Kauri dieback infection. Maybe the trees we plant or keep alive today will eventually grow to be as great as, or even greater than the mighty Tāne Mahuta. Certainly, this would be a great legacy for Hawke’s Bay.